Gorent was founded in Florence in 2002. 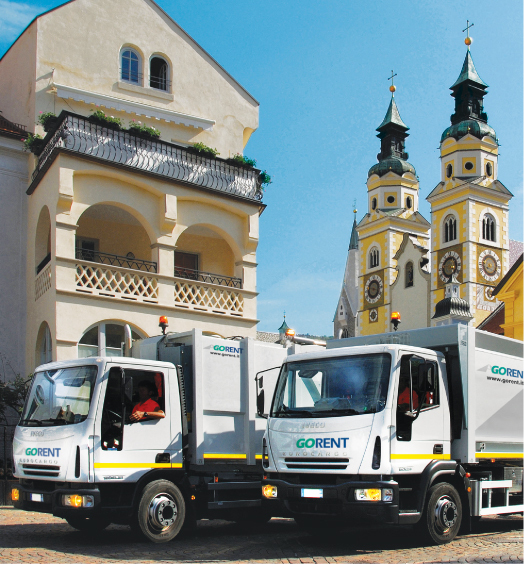 Gorent is the first company to provide rental services in the waste collection and municipal hygiene vehicles sector. A successful “full services” formula that enables public administration bodies and private companies to optimize their running costs with fleets that are not only updated constantly but also aligned to the very latest environmental sustainability parameters. Thanks to this leadership position, Gorent has become a major point of reference for key municipal hygiene sector players. Alongside its rental services, Gorent has entered into the business of sale of secondhand vehicles following rental, and collection and trade-in arrangements for our customers’ secondhand vehicles. Within the ambit of high-tech services provision, our company has designed Ecoflot, a proprietary web platform based on satellite control for real-time monitoring of the vehicles’ activities, in order to certify and optimise productivity flows. Gorent develops ongoing synergic relations with Eco.energia − a company of the Group which is active in the sector of selected waste collection and as an agent in Italy for the Olly brand, a system for collecting and recycling waste edible oils from households, production facilities and catering establishments. Within the ambit of the activities undertaken to further organic growth of the Group, Gorent has developed an internationalization strategy in order to extend its rental business to Europe, as a unique, distinctive, high added-value business model. Every three years, we renew our rental vehicles fleet. It is an occasion to select low environmental-impact motorization solutions and adopt low-pollution technologies, e.g. use of biodegradable engine oil and greases and electromagnetic braking retarders, which reduce wear and tear of the brakes to curb dust emissions.